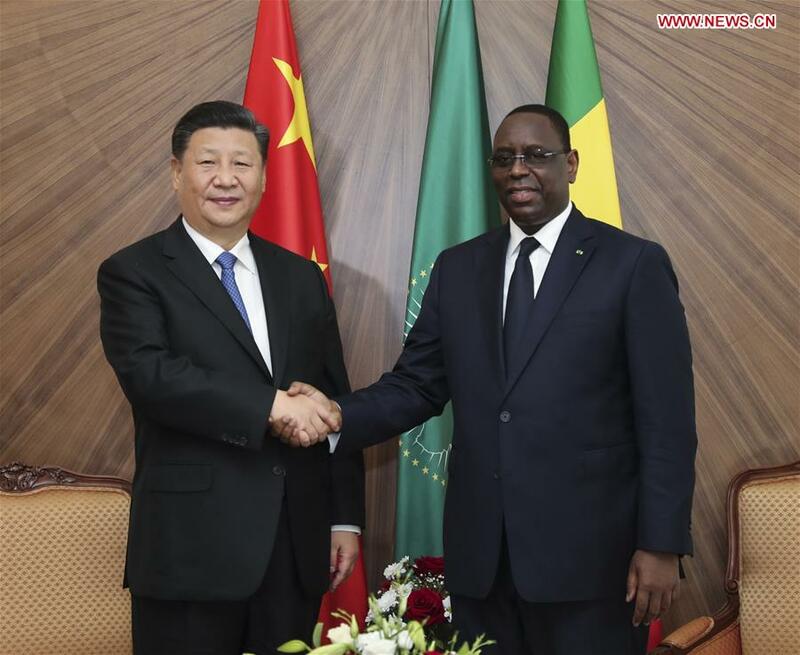 DAKAR, July 21 (Xinhua) -- Chinese President Xi Jinping and Senegalese President Macky Sall held talks here Saturday, vowing to create a better future for China-Senegal ties. The two leaders spoke highly of the development of bilateral ties in recent years, and agreed to continue to make joint efforts and promote more fruitful results from cooperation in various fields. Xi arrived here earlier on Saturday for the first state visit to Senegal by a Chinese head of state in nine years. During the meeting with his host, the Chinese president thanked the government and people of Senegal for their warm hospitality and welcome, saying it fully demonstrated that China-Senegal friendship has gained broad support. Recalling their joint decision to forge a comprehensive strategic cooperative partnership between the two countries in 2016, Xi said that thanks to joint efforts from both sides, China-Senegal relations have entered a fast track with growing political mutual trust and concrete economic and trade cooperation. China is willing to join hands with Senegal to lift bilateral ties and cooperation to a higher level, so as to bring more benefits to both peoples, Xi said. The Chinese president expressed appreciation to Sall for viewing their ties from a strategic perspective, positively responding to the Belt and Road Initiative and strongly supporting China-Africa cooperation. The two sides should carry out closer high-level exchanges and support each other on issues concerning their core interests and major concern, said Xi. Noting that the two countries should strengthen the alignment of development strategies and policy communication, Xi welcomed Senegal to be the first West African country to sign a Belt and Road cooperation document with China. We hope to take this opportunity to comprehensively upgrade China-Senegal cooperation, he said. China will continue to uphold the spirit of "teaching a man to fish," expand and deepen cooperation with Senegal, and enhance its ability in independent development, Xi said. He called on the two countries to boost people-to-people exchanges and promote mutual understanding between the two peoples. The two sides should enhance law enforcement and security cooperation, Xi said, adding that China supports Senegal in building capability in counter-terrorism, peacekeeping and safeguarding stability. China supports Senegal in playing a greater role in global and regional affairs, and is willing to strengthen communication and coordination with Senegal in major international and regional issues such as peace and security in Africa, the United Nations and climate change, so as to protect the common interests of Africa and developing countries, said the Chinese president. Noting that he attaches great importance to China-Africa ties, Xi said he feels strongly about the long-term friendship between China and Africa, and their common future in sharing weal and woe. The two sides are sincere partners on their path of development and natural allies in international affairs, Xi said, adding that China's development will bring more opportunities to Africa, while Africa's development will add momentum to China's development. China will continue to uphold its African policy and concept of sincerity, concrete results, affinity and good faith, uphold justice and pursue shared interests, promote the construction of a closer China-Africa community with a shared future, so as to realize win-win cooperation and common development, Xi said. In September, we will hold a summit of the Forum on China-Africa Cooperation (FOCAC) in Beijing, said Xi, adding that he is looking forward to meeting African leaders including President Sall in Beijing and discussing the important agenda on China-Africa cooperation. For his part, Sall thanked President Xi for visiting Senegal in his first overseas trip since being re-elected as Chinese president, saying that it is Senegalese people's honor. Hailing that China made significant contributions to humanity's progress in history, Sall said today's China is playing an even more important role in international affairs. Senegal, Sall said, admires China's development achievements, appreciates China's precious support for Senegalese economic and social development and its implementation of revitalization plan. The bilateral ties, based on solidarity, mutual trust, mutual respect, win-win and mutual benefit, are strong and satisfactory, said the Senegalese president. Senegal firmly adheres to the one-China policy, is committed to deepening the comprehensive strategic cooperative partnership with China, stands ready to enhance cooperation in areas such as infrastructure construction, water conservation, industrialization, agricultural product processing, tourism, culture and sports, said Sall. Senegal supports China's Belt and Road Initiative and stands ready to vigorously participate in connectivity construction, Sall said, adding that his country appreciates China's contribution in Africa's peace and development cause. The FOCAC is a cooperative framework featuring inclusiveness, effectiveness and solidarity, established on the basis of practical cooperation, Sall said, vowing Senegal's full support in strengthening the FOCAC, deepening cooperation between China and Africa, and establishing the China-Africa community with a shared future. Senegal is ready to strengthen communication and coordination with China in multilateral affairs, and work with China to build a more balanced, just and inclusive global governance system, safeguard multilateralism and oppose protectionism, Sall said. After their talks, Xi received Senegal's top medal of honor from Sall, and the two leaders witnessed the signing of multiple cooperation documents, including the one on jointly building the Belt and Road. Before the talks, the Senegalese president and people held a grand welcoming ceremony for Xi, with thousands of locals dressed in festive attire, cheering, singing and dancing. Senegal's official guards of the presidency also put on a magnificent parade on the streets of Dakar escorting the Chinese president. Senegal is the second stop in Xi's first overseas trip after being re-elected Chinese president in March. He has already visited the United Arab Emirates and will pay state visits to Rwanda and South Africa, attend the 10th BRICS summit in Johannesburg, and visit Mauritius during a stopover.